We’d love your help. Let us know what’s wrong with this preview of Martin Luther by Eric Metaxas. To ask other readers questions about Martin Luther, please sign up. I rather like Martin Luther. Admittedly, there is more than I don't know about him than do. I think of him as a brave, irascible and earnest believer. Not, someone, I would wish to go camping with for a week. Sailing would be worse. You can't get away from someone else on a small boat. He had many flaws—feet of clay is the usual euphemism. But, he translated the Bible into German for people to read for themselves. I respect reading a book for yourself. He can’t be all bad. So, I am looking forwar I rather like Martin Luther. Admittedly, there is more than I don't know about him than do. I think of him as a brave, irascible and earnest believer. Not, someone, I would wish to go camping with for a week. Sailing would be worse. You can't get away from someone else on a small boat. He had many flaws—feet of clay is the usual euphemism. But, he translated the Bible into German for people to read for themselves. I respect reading a book for yourself. He can’t be all bad. So, I am looking forward to his new biography. Critics and audiences give it rave reviews. But, I couldn’t like it. I kept trying, but this just didn’t work for me. It seemed more an admiring sermon than a biography. I realize that a lot of folks are enjoying this book. Some are reading it as a part of their Sunday school study. I wish them every happiness. •Luther’s theological studies, the only book novices were allowed to read was the Bible, but only novices could read the Bible. Once you became a monk, your Bible was taken from you. •Monks only read scholarly books, which is how Luther read the sermons of Jan Hus, a Czech theologian and a key predecessor to Protestantism who was condemned and burned at the stake in 1415, while at the Erfurt monastery. •In 1510, the 27-year-old, Luther made a pilgrimage to Rome. He “seriously lamented that his parents were still alive” and did not qualify for reduced time in purgatory. •Archaeological study of his childhood home determined that 60% of the Luther family diet was pork. There are, also plenty of bones from sheep, goats, cattle, chickens, and geese. Suggesting that they were quite well off financially. •The 1517 posting of the Ninety-five Theses on the great wooden doors of the Wittenberg Castle Church never happened. •The feather of an angel was one of the religious relics at the Castle Church in Wittenberg, along with one complete skeleton of one of the infants killed by Herod in Bethlehem. But, once he dropped the hooks, I lost interest. Maybe, I just don’t like Metaxas’ writing. It felt like I was reading VeggieTales for adults. And, the ridicule of others was tiresome. Regarding the bull, Exurge Domine, 1520, Aetatis 36, he begins, “And so it was in these halcyon environs, influenced by the imagery of the hunt, that Leo in his Latin preface to the bull now likened Luther to a “wild boar” that had invaded the Lord’s vineyard. Later in the short preface, Luther is magically transformed into a slithering serpent that has invaded the field of the Lord. Whether this shift in pejorative bestial imagery from porcine to serpentine was intentional, or whether everyone was simply disinclined to point it out to the profligate pontiff, can never be known.” This strikes me as mincing ridicule of Luther’s advisory. And Luther never needed anyone to speak up for him. He had self-advocacy down pat. There’s a bit that I think of as the golden scheisse part. I included a couple of sections. It should give you an appreciation of the book’s style. It is in Chapter Five, The “Cloaca” Experience and works to reconstruct Luther’s path to the Ninety-five Theses. The chapter opens with a quote. One of the iconic moments from Luther’s life has come to be called “the tower experience.” As the story comes to us, it was during this world changing year of 1517 that Luther’s struggles with that verse in the book of Romans came to fruition. But as with so much else with Luther’s story, it is the Luther legend that obscures our view of the actual events of his life—and the legend almost always comes to us via Luther’s later recollections of what took place decades earlier. Nonetheless, the moment in which the Middle Ages buckled under their own weight and thus gave way to the Reformation and the future seems to have occurred when a single tremendous insight came to Luther, who was at that moment in the so-called Cloaca Tower at the Black Cloister in Wittenberg. In 1532 and then again in 1545, Luther mentioned what happened at that point, sometime in early 1517. *Luther and those around him were usually fluent or at least conversant in Latin, and we can see from this sentence that Luther often spoke macaronically, which is to say in a language that combined two other languages, in this case German and Latin.bined two other languages, in this case German and Latin. First sentence: There is no beginning to the story of Martin Luther. I have read a good many biographies of Martin Luther in recent years. Some have been short. Some have been long. Some have focused on the historical. Some have focused solely on the theological. Some have been compelling. Some have been boring. I'll be honest. Concise isn't always better. There is such a thing as keeping Luther's life story so basic, so simple, so compact that it becomes dull, dry, BORING. The problem isn't that First sentence: There is no beginning to the story of Martin Luther. I'll be honest. Concise isn't always better. There is such a thing as keeping Luther's life story so basic, so simple, so compact that it becomes dull, dry, BORING. The problem isn't that Luther led a dull life with hardly anything ever happening. Far from it! The problem is that putting Martin Luther into context--historically, spiritually, theologically--takes a lot of words and details. Rob a biography of good, substantive, meaty details, and it becomes dull. Metaxas' biography thrives on details. Readers need details--not just about Martin Luther himself--but about everything. Luther cannot be understood apart from his times, apart from his contemporaries, apart from his writings. Can Luther be understood fully? Can any man--or woman--be understood fully?! Any biographer who thinks they have grasped everything there is to grasp and know everything there is to know, and can explain the inner workings of Luther's heart and mind from birth to death aren't to be trusted. Luther is not simple. His biography shouldn't be simple either. I would definitely recommend this one. I found it a compelling read, though not a quick one. The bad news: Metaxas' chapters are super-long. This almost forces you to slow down your reading--to take time with the text. That's also the good news. There is something to be said for going slow and steady through a book. Martin Luther is worth spending time with, worth engaging. And you just don't get that when you rush through a book. Strangely enough, once a novice became a monk, he was no longer allowed to keep his Bible. At that point, he must limit himself to only reading scholarly books, and those while in his cell. It seems that only in Luther's private time in the library of the monastery did he have access to the Bible after his novitiate. This is one of my favorite books this year. Not only does Metaxis tell a lively and entertaining story of Luther's life, he explains how world-changing his stand for the truth really was. This is truly when the modern world began. For better and for worse. The ideas that we take for granted in our pluralistic society--freedom of conscience, separation of church and state, and the notion that might doesn't make right-- were birthed in Wittenberg exactly 500 years ago. Per the first half of my header, that's the only reason I rated this book with two stars rather than one. Even though Metaxas discusses Luther's differences with the Reformed on the Eucharist, and a lesser degree on other things, and even tries to take a look at both the philosophy and theology behind this (while failing as much as succeeding), Metaxas still tries to paint Luther as a modern American conservative Evangelical rather than as a German Evangelical, ie, Lutheran. The epilogue, trying to pretend Luther was some sort of forerunner of modern Western democracy, only made this worse — and more laughable at the same time. Again, though, the fact that it's being tried, and will probably be tried by others from now through maybe 2030, with the 500th anniversary events, gets it that second star rather than 1. That said, there's other errors, mainly errors of fact, though a few others of interpretation, like those above. I actually was originally going to rate it three stars, despite the above, but two errors late in the book got it knocked down to two stars, and almost to one, in spite of me wanting to hold it up as an example. OK, let's dive into those errors. First, after debunking several Luther myths in the introduction, Metaxas perpetuates two BIGGIES himself. In reality, the consensus of good historians is that Luther did NOT nail, paste, or otherwise affix a sheet or two of 95 Theses to the door of the Castle Church in Wittenberg on Oct. 31, 1517. A similar consensus says that Luther did NOT say "Here I stand" at the Diet of Worms. OK, next. Erasmus did NOT restore first-century Greek to his edition of the New Testament. Instead, his "textus receptus" was similar to that in the Orthodox world of this time. Erasmus didn't have Sinaiticus, Vaticanus or other older codices, nor did he have the treasure of modern papyri finds. Also, Erasmus had no detailed methodology of textual criticism. Tonsuring? It's Christian martyrological legend that emperors inflicted it upon apostles or later generations of Christians. That said, per the likes of Candida Moss, the severity and broadness of Roman Imperial persecution of Christians has itself been mythologized. Finally, although in these cases it involves shaving the head entirely, not just in spots, tonsuring-like practices are known to other world religions. The idea that Luther didn't have a "modern" idea of consciousness? Well, Metaxas sets up a straw man by claiming that what he calls the "modern" idea of consciousness is modern. Less than a century after Luther, Shakespeare has Polonius in Hamlet say "To thine own self be true." And, a full 2,000 years earlier, the oracle at Delphi said "Know thyself." And, from that, Socrates said, "The unexamined life is not worth living." Of course, Metaxas is here ultimately setting up a bank shot for how Luther was different from today, but yet, was a lead-in to Merika or something. After Erasmus, Metaxas trips on his Greek New Testament again. While the verb synago is in the New Testament in various forms, including as a participle for gathering together for worship, including gathering for the Eucharist, the noun synaxis is not. It is used in post-NT writings, I believe beginning as early as the Didache, but the noun is not in the NT. Now, the two biggies, which give the game up. On page 391, Metaxas claims that Suleiman the Magnificent, as part of expanding the Ottoman Empire, was trying to expand sharia law. Tosh and rot. The Turks, and their Central Asian Turkic cousins, have been known for their generally moderate interpretation of Islam. And the Ottoman Empire was known for its millet system, which gave a relatively high degree of freedom to its Christian — and Jewish —residents. Given that Metaxas, if not a full blown right-winger, hangs out with a lot of conservative politicos and is a talking head for a major right-wing radio network, I can only consider this to be rank pandering. Page 417 follows in its train. Metaxas claims that Luther, in his anti-Jewish diatribes, was influenced by "Victory over the Godless Hebrews," which he claims contain things "which we now know to be untrue." Among this, he lists Jewish blasphemies against Jesus and Mary, and claims by Jews that Jesus did his miracles by kabbalistic magic. Deleting the "kabbalistic," as it didn't exist 2,000 years ago, and actually, these things ARE true. Metaxas is either ignorant of some things written in the Talmud, and even more in the Toledoth Yeshu, or he's heard about such things and refuses to investigate, or thirdly, he fully knows about them and covers them up. (This does NOT mean, though, that the Talmud contains blood libels against Christianity or anything close.) But, yes, the above materials do claim that Jesus was a mamzer and a magician. In any case, I suspect political leanings not just of general conservativism, but specifically neoconservativism, are now in play. This is not a good book. It is entertaining, but horribly biased (I can deal with that) and stupidly inaccurate. For example, "Salve Regina...." does NOT mean "Save us, Mary" in Latin. So, using that as moment to riff on how medieval Christians depended on saints to save them - wrong, wrong and wrong. I could go on, but as I shared these little tidbits with a friend who is a respected Reformation historian at a Lutheran college, he said, "Why are you reading something that stupid" and suggested L This is not a good book. It is entertaining, but horribly biased (I can deal with that) and stupidly inaccurate. For example, "Salve Regina...." does NOT mean "Save us, Mary" in Latin. So, using that as moment to riff on how medieval Christians depended on saints to save them - wrong, wrong and wrong. A definitely well-written and thoroughly researched book portraying life and vision of a man who did change the world of religion. I recommend it to anyone interested in Martin Luther. It takes some time to read the book but the effort is worthwhile. Good read overall. Not to be controversial, but I thought the prologue and epilogue alone were enough to get a good feel for the impact of Luther’s life (If you don’t have time to read the whole book). Overall, this was a good picture of how God used a deeply flawed man who was willing to stand up to systematic oppression, and changed the course of history in the process. Maybe 4.25? Metaxas is excellent as a biographer. He makes the story come to life and turns it into a page-turner. His witty, joking style is enjoyable, but you can also see what an intelligent man he is. I have loved every biography he has written. I grew up Lutheran and heard much about Martin Luther and his 95 theses. Reformation day was like a holiday in our school and I even remember having a cake made in the shape of the Luther's coat of arms one year. I was surprised to hear many of the th Maybe 4.25? Metaxas is excellent as a biographer. He makes the story come to life and turns it into a page-turner. His witty, joking style is enjoyable, but you can also see what an intelligent man he is. I have loved every biography he has written. I grew up Lutheran and heard much about Martin Luther and his 95 theses. Reformation day was like a holiday in our school and I even remember having a cake made in the shape of the Luther's coat of arms one year. I was surprised to hear many of the things we learned about Luther were incorrect! Metaxas clears up most of what is legend and presents what the actual facts about Luther are. I enjoyed how much he quoted personal letters and documents from Luther's life. What I found most interesting was seeing more what the church was like at the time of the Reformation. No one read the Bible or even knew what it said (even the church leaders! ), church services were in a language most people could not understand. It seems like God's Word was veiled for hundreds of years- how did God allow it to be like that for so long? Although Luther definitely had his flaws, he mostly is a likable character who reminds me of many of my blunt German-Lutheran extended family members. He unknowingly started something that changed the trajectory of the church and religious freedom forever. What he accomplished in short years is unbelievable. He definitely is one of the most impactful people of history. Eric Metaxes wrote quite a beautiful book on Luther. I’ve read other biographies on him and I’m very grateful for the respectful and yet open, honest view on his life and teachings. It feels as if Metaxes got to know Luther personally. This took me awhile to read because it was my bedtime reading book, and I can only read a chapter at most before my eyelids get heavy. But that's not a reflection of this book, because it's actually quite interesting and action-packed. However, because I read it over a long period of time, I started losing track of who was who. There are a lot of names. Some people start as Luther's friends and then becomes enemies (and some frenemies) and vice versa. The author's main thesis, about Luther basic This took me awhile to read because it was my bedtime reading book, and I can only read a chapter at most before my eyelids get heavy. But that's not a reflection of this book, because it's actually quite interesting and action-packed. However, because I read it over a long period of time, I started losing track of who was who. There are a lot of names. Some people start as Luther's friends and then becomes enemies (and some frenemies) and vice versa. The author's main thesis, about Luther basically being responsible for the modern world, isn't really hit on until the very end. Even though other people had the same ideas of a pure Gospel, a Bible written in people's own language, and denying the absolute authority of the pope, it was Luther who was able to get those ideas to spread thanks to the recent invention of the printing press, the protection of a powerful prince, and the Holy Roman Emperor being distracted by other wars. I have always found it interesting that you can profitably read a lot about some people in context without reading a biography while for others it seems important to read through their life story. The trouble, of course, is knowing which is which. I was hesitant to start the new Metaxas biography of Luther. How does one go about writing a one volume biography of one of the most commented upon lives ever? I feared it would prove grossly oversimplified and not do justice to Luther. How silly of me I have always found it interesting that you can profitably read a lot about some people in context without reading a biography while for others it seems important to read through their life story. The trouble, of course, is knowing which is which. I was hesitant to start the new Metaxas biography of Luther. How does one go about writing a one volume biography of one of the most commented upon lives ever? I feared it would prove grossly oversimplified and not do justice to Luther. How silly of me to be worried! This is a terrific book that was masterful in getting out the basic plot of Luther’s life while allowing me to fit the story into a broader context. More than this, Metaxas makes a strong argument for the importance of Luther in modern history and then follows through effectively in the details of his case. He is especially effective in delineating the terms of the conflict that Luther had with the Church on the selling of indulgences and other abuses of temporal authority. The discussion of “conscience” would be a good example. This was really helpful. Metaxas was also effective in bringing out the importance for Luther and the Reformation of the new printing press and importance of involving the common people and a vernacular language in the disputes over Church doctrine and politics. This is another key aspect of how Luther helped usher in the modern age and it is consistent with other treatments, such as Pettegree’s “The Book in the Renaissance”. Metaxas also makes the point which should be obvious but is not that by denying the discretion open to the Church as the filter for doctrine and rules, Luther effectively separated truth from power and introduced a central conflict of the modern age - one that brought both good and bad to the world. The transition from the Middle Ages to the Renaissance and to Modernity is difficult to understand on a good day. Metaxas does a service to readers by helping to clarify Luther’s role in it. Eric Metaxas' biography is an immersive account of the great church reformer Martin Luther accessible to all readers. Written as a story vice an academic biography Metaxas brings Luther to life from childhood and formative years through the apex of his career until his later years of life. This full scope story includes the historical background and events that shaped Luther's struggle with the Roman Catholic Church and the secular leaders of the day. In reality this book is much more than just Eric Metaxas' biography is an immersive account of the great church reformer Martin Luther accessible to all readers. Written as a story vice an academic biography Metaxas brings Luther to life from childhood and formative years through the apex of his career until his later years of life. This full scope story includes the historical background and events that shaped Luther's struggle with the Roman Catholic Church and the secular leaders of the day. In reality this book is much more than just a biography, it is the story of the Reformation from Luther's perspective. Eric Metaxas draws some very interesting conclusions in his biography regarding the use of the printing press and how it helped shape the Reformation. He discusses how the writings of Luther were in demand by the population at large and the use of the printing press helped distribute these writings in mass - one of the first examples in Western history of the use of "mass" media to promulgate information. Interesting to note Luther was unprepared for this result and as such lost control of the movement to reform the Church as much as the Church lost control of the methods to try and stop him. Metaxas asserts that Luther and the Church were unable to keep in check what information was distributed and how it was distributed to the public at large. As an example, Metaxas shows that Luther's 95 Thesis were written by Luther in Latin to engage in academic debate. They were never intended to be published for mass consumption, instead wanting scholarly dialog to discuss and work through the issues internal to the Church. This intent was lost when the thesis were republished in German and distributed broadly through Germany and beyond. In a number of places throughout the narrative Eric Metaxas identifies untrue stories about Luther, dispelling them or putting them in the proper context. Such falsities as Luther being of peasant stock, or the nuns and the herring barrels, etc. are addressed and put right. The picture painted of Luther by Metaxas is of a renaissance man; while being highly educated is able to freely move, relate, converse and stand up for to the common folk. At the same time I believe Metaxas goes overboard attributing to Luther the introduction of pluralism into society - creating himself a bit of a hagiographic story about Luther. A religiously pluralistic society is result of the Reformation and other political events of the times, but I don't believe this rests solely on Luther's shoulders. In reality, there were a number of things happening during the 16th Century including individuals, inventions such as the printing press, and events such as the Holy Roman Empire's war with the Turks and France, and the corrupt leadership of the Roman Catholic Church that precipitated Reformation and allowed it to take root instead of being stomped out. It is obvious this is a biography written by a fellow Lutheran who views the subject of Luther's life in a favorable light. It is a great story for those that don't mind a biography that is written from such an admiring perspective. For those looking for an unbiased academic biography, or perhaps the perspective of the Roman Catholic Church you will not find a sympathetic read. Excellent! The mammoth amount of reading and research that Metaxas did for this book is evident. I read the audio version which is why I finished it, I'm sure. Metaxas text held my interest. He was also the narrator and was enjoyable to listen to. The book contained way more material than I expected. As most things are, the Reformation resulted from many more convergences than Luther simply posting some points he wished to discuss (which were never debated). All the chapters were interesting, bu Excellent! The mammoth amount of reading and research that Metaxas did for this book is evident. This review has been hidden because it contains spoilers. To view it, click here. It obviously wasn’t an accident that this biography of Martin Luther was published in 2017 which marked the 500th anniversary of The Reformation on October 31, 2017. I learned so much about Martin Luther, his life, and the legacy that he left. During Luther’s time, the Catholic Church was in bad need of reform. The main issue that Luther took umbrage to was the sale of indulgences which were what his 95 theses were based upon. “Indulgences” were sold by the church which allowed someone to purcha It obviously wasn’t an accident that this biography of Martin Luther was published in 2017 which marked the 500th anniversary of The Reformation on October 31, 2017. I learned so much about Martin Luther, his life, and the legacy that he left. During Luther’s time, the Catholic Church was in bad need of reform. The main issue that Luther took umbrage to was the sale of indulgences which were what his 95 theses were based upon. “Indulgences” were sold by the church which allowed someone to purchase “Butter Letters” to eat freely during Lent all the way to buying documents signed by priests which gave the buyer less time in purgatory, or to bypass purgatory altogether and go straight to heaven. After the 95 theses were posted at the College Church in Wittenberg, he went on to point out many other things that the Catholic Church should take a look at. Ultimately, many years after he died, Vatican II finally adopted many of his reforms. His contribution to the history of the world is perhaps the most important of all because of the ripple effect of his standing for his beliefs and morals (always peacefully), come what may. Luther’s theology wasn’t perfect, some of his beliefs don’t seem to reconcile, and his late in life writings about Jews we found out during WWII were extremely hurtful, but his lasting legacy was to bring the church to the people - communion given to the laity, congregational hymns, and he translated the Bible into German so regular people could read it. It is interesting to note that he and his reforms may not have even happened had the printing press, which was new at that time, not been available to broadly and quickly disseminate his various works. I highly recommend this biography of Martin Luther if you are interested in a very readable history of this extremely fascinating figure. Martin Luther has become a firebrand icon but like so many firebrands, a lot of his story is steeped in myth. It has become another case of fiction replacing history, with novelists and (some) historians choosing that over reality. 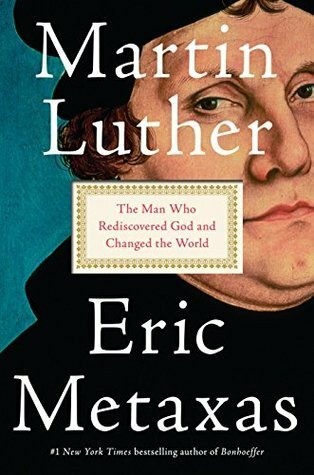 Eric Metaxas does a good job by deconstructing Luther and presenting us with the real man behind the leader of the Protestant reformation. This was a fascinating biography. It exposes a few myths, and gives us the real events and details. Also, the book does a good job of taking us into the world at the time of Luther, giving us a better understanding of history and the man Martin Luther. Metaxas writes the inherently interesting story of Martin Luther in an interesting way. You can tell he’s a big fan of Luther but he fairly touches on his flaws as well. The great biography on Luther, such a fascinating and rich period & life. I had high hopes for this biography, but the further I read, the more those hopes were dashed. In one sense, this is a very thorough biography. Metaxes includes a lot of detail but in a readable way. That was what I was expecting. However, none of this is actually new material. There isn't anything enlightening or revealing but rather a rehash of what hundreds of other writers have included seasoned with Metaxas' own special form of hagiography. While Martin Luther was a great man who definitely I had high hopes for this biography, but the further I read, the more those hopes were dashed. In one sense, this is a very thorough biography. Metaxes includes a lot of detail but in a readable way. That was what I was expecting. However, none of this is actually new material. There isn't anything enlightening or revealing but rather a rehash of what hundreds of other writers have included seasoned with Metaxas' own special form of hagiography. While Martin Luther was a great man who definitely changed our world for the better, he was not without his flaws. EM does not leave those out, but he definitely does go to creative (and occasionally eye rolling)lengths to explain them away. Even still, I probably would have given this book one more star if it weren't for his over the top conclusion in which he tried to tie Luthor's legacy to every single good thing that has happened in Western civilization over the past 500 years. Good, with some pertinent analysis of Luther's ubiquitous influence on not only ecclesiology, but also politics, economics, et al. As with his biography of Bonhoeffer, Metaxas fills in a lot of gaps in popular history, and also debunks some popular mythology. The biggest shortcoming to this reviewer is that he makes no mention of Luther's most powerful work, the commentary on Paul's Epistle to the Galatians. 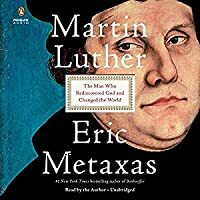 Erix Metaxas has done a great service to students of history and religion with this masterful biography of Martin Luther, whose campaign against the abuses of the medieval Roman Catholic Church sparked the Protestant Reformation. I came away with a new appreciation for this complex man and his role in creating western democracy. I came away from this book in awe of the sovereignty of God in Luther's life and in the lives of popes, kings, & nations. So much of what we take for granted in Western culture comes from the work of Martin Luther. He was an imperfect man that God used (among others) to reform His church. I listened to the audio version. This is in excellent book. It is very thorough and comprehensive. I learned a lot about Martin Luther from this book. I find it amazing how conversations can be reconstructed from over 500 years ago. The only suggestion I have for this book is that the vocabulary was well above the vocabulary that I’m used to. This is good because it is challenging. Less a biography of Luther and more a biography of the Reformation. Definitely not a page turner, but very insightful and thought provoking throughout. Discusses the political climate at the time as well which was very helpful in understanding how the Reformation was able to take hold. The entire book though may be worth the last chapter - it focuses on how the Reformation ultimately created Western Civilization as we know it. Listening to the Penguin audio narrated by the author, was a rewarding experience. On the occasion of the Protestant Reformation’s five hundredth anniversary, books about Martin Luther have been pouring off the presses. Eric Metaxas’ Martin Luther will probably sell the most copies, perhaps more than all the other combined. It debuted at number seven on the October 22, 2017 New York Times’s bestseller list. It is still a bestseller on Amazon.com. I had high hopes for this biography. Luther lived a big life, one of world-historical importance. His actions laid the foundations of On the occasion of the Protestant Reformation’s five hundredth anniversary, books about Martin Luther have been pouring off the presses. Eric Metaxas’ Martin Luther will probably sell the most copies, perhaps more than all the other combined. It debuted at number seven on the October 22, 2017 New York Times’s bestseller list. It is still a bestseller on Amazon.com. I had high hopes for this biography. Luther lived a big life, one of world-historical importance. His actions laid the foundations of the modern world, a result that he, steeped in medieval assumptions about Christendom, would most likely have abhorred. (On that topic, see Brad Gregory’s Rebel in the Ranks.) The public needs a standard, readable account of such a life in every generation, and I had hoped that Metaxas’ biography would be the worthy successor to Roland H. Bainton’s classic, Here I Stand. Metaxas on Luther is good, but not great. Martin Luther covers the same ground as Here I Stand—the latter is the first reference in Metaxas’ bibliography—but Bainton tells the story with more economy and verve. Metaxas is a beautiful writer, but compared to Bainton, I felt he got lost too often in the narrative weeds. For example, while Metaxas writes about Luther’s insight into the meaning of the phrase, the righteousness of God, as well as about his articulation of the doctrine of justification by faith, neither word—righteousness, justification—has an entry in the index. So, a researcher looking for Metaxas’ treatment of Luther’s theology—the doctrine on which the church stands or falls!—won’t know where to find it in the book. On occasion, Luther’s word choice and his drawing of extended metaphors is too precocious. He uses the Latin word Aetatitis in chapter headings, for example, to mark the years of Luther’s life. I’m still stuck on his use of the word ensorcelling, when the more well-known enchanting or fascinating would’ve worked just as well. And why he insists on using Kathie instead of Katie as the diminutive for Luther’s wife, Katharina von Bora, is beyond me. It’s like Metaxas feels he needs to break with convention just for the heck of it. Martin Luther is probably too long and involved for the general reader, but not researched thoroughly enough for the academic reader. It doesn’t advance any new insight about Luther, dependent on other studies in that regard. Like I said, good, but not great. If you’re going to read just one book about Luther this year, I’d stick with Here I Stand. Eric Metaxas Martin Luther: The Man Who Rediscovered God and Changed the World (New York: Viking, 2017). Author was on the GB radio show himself 10/9/17 for this book. Also wrote a highly recommended book on Bonhoeffer.